David Hovey stands beside his work. A card depicting the inspiration piece by Rockwell is beside him, below his painting. The Piqua Arts Council asked artists to imagine what Rockwell's work would look like if he were painting in the 21st century. The results are featured in a exhibit titled "Rockwell Reimagined" at the Piqua Public Library. "We wanted the artists to take a Norman Rockwell Saturday Evening Post cover and reinterpret it to reflect the changes in society between Rockwell's time and now," says Executive Director Jordan Knepper. The idea came from an arts patron who said every time he'd suggested the idea, he'd "been laughed out of the building." But the Piqua Arts Council wasn't laughing. It embraced the idea and put out a call for artists to submit their work for a juried competition and exhibit. 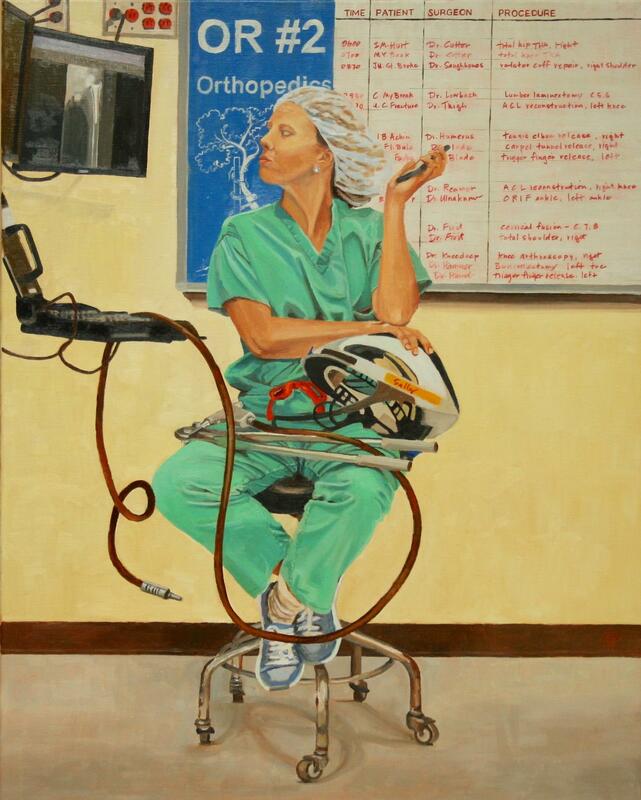 Artist Carol Granger reimagined Rockwell's "Rosie the Riveter" by placing the titular character "Sally the Surgeon" in an operating room. After two years of planning and effort, the final exhibit features the work of 35 artists from around Ohio. "A lot of people jumped on the technology aspect of it and the advancements in technology," Knepper says, pointing to one piece where the artist was inspired by Rockwell's At the Breakfast Table. "The artist has reimagined that with the family now on their iPads and computers and the little girl is even on her cell phone." Artists took on social issues, too. 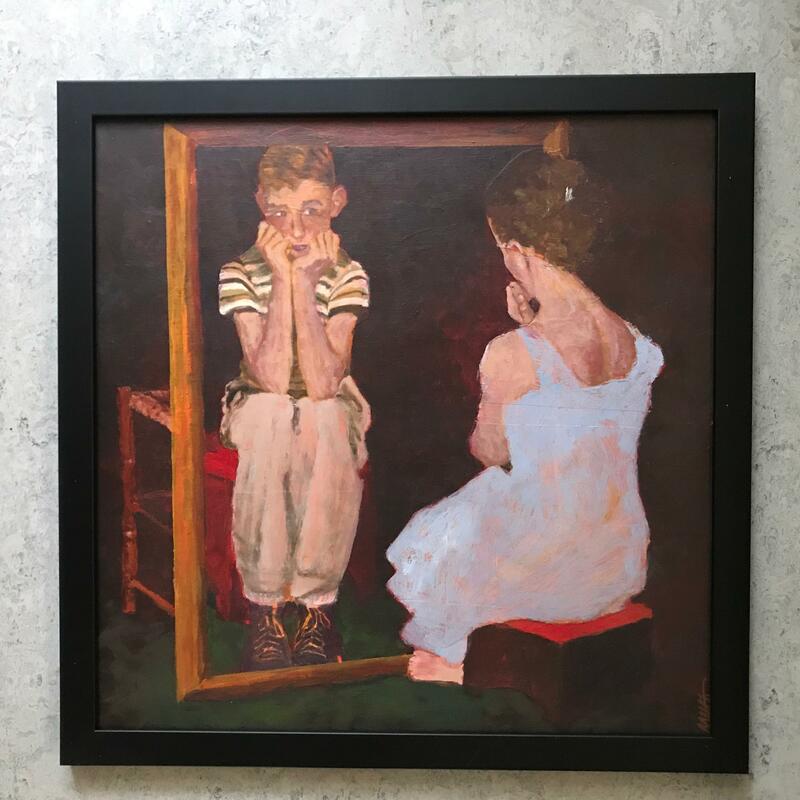 One of the winning entries features a girl looking into a mirror and seeing a boy reflected back. Artist Michelle Geissbuhler's take on Rockwell's 'Mirror Image' left Judge Peter Doebler saying, "While Rockwell's painting has objects that shape what the girl is and thinks she should be - the doll, brush, and glamour magazine - this painting removes these details and simplifies to just the girl looking at herself with no influences, prompting the question of how we might see ourselves differently if given the chance." Each work of art - and they're not all paintings; Knepper is proud the collection includes various mediums - is displayed with a card beside it depicting the inspiration piece. "You really get to see what the artist was thinking and how they evolved the idea into the new situation." Knepper says there were a few roadblocks along the way that had to be considered. "A lot of the artists that we work with are not portrait painters, they don't enjoy painting the figure and faces. It took a while to get all of the responses so that we had a nice number for an exhibit." The exhibit is open during library hours through April 19. There is some discussion about making a traveling exhibit available if the artists are willing to allow their artwork to be gone for at least a year. Knepper says the Council has heard from interested institutions including museums from as far away as Georgia. Knepper says the exhibit could lead to more in a similar vein. "Somebody brought up Van Gogh, and then we would have artists either paint their subject in a Van Gogh style or paint a Van Gogh painting in their style." The annual celebration of vintage modern art and furnishings known as 20th Century Cincinnati returns to the Sharonville Convention Center on February 23 and 24.